Lewis Polk sent me a sample of the new CRE-55491 on-board receiver for evaluation. This part was apparently a pre-production unit. It was so new that it came without packaging or even instructions. I've been able to extract a little information about this unit ahead of its formal introduction. The CRE-55491 is intended to replace the ART-5490 mini receiver. The 55491 unit operates at 75 MHz to allow a more effective on-board antenna. The older 27 MHz 5490 used a 1 meter (3 foot) antenna, the 55491 uses a 30 cm (1 foot) antenna. Antenna problems did tend to plague the 5490. I understand that there will also be a 40 MHz unit for use in countries that don't allow the use of the 75 MHz band for this kind of application. 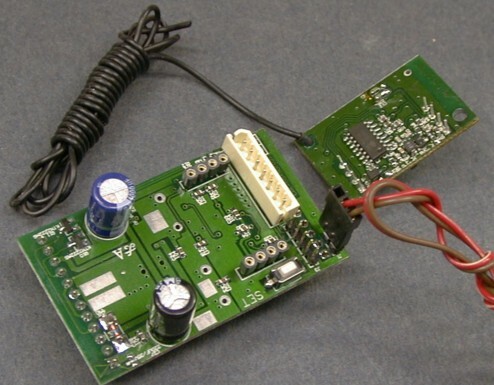 The unit consists of a two circuit board assembly. The control electronics and interconnections are on the lower board, the RF circuits are on the upper board. 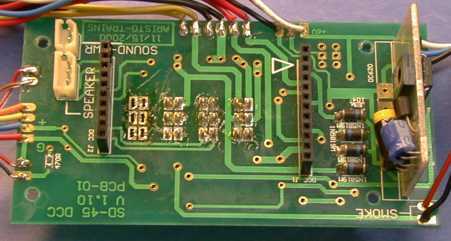 There is a code set switch on a pigtail lead and another code set switch on the larger board (buried under the lower right corner of the RF board and accessible through a hole in the RF board). 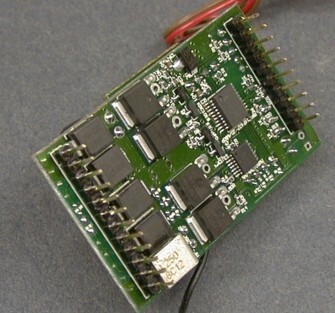 There is also a connector for a CRE-55495 accessory control board. However, the current 55495 also has a board mounted pin connector and doesn't come with an interconnection harness to allow it to plug into the 55491. Newer 55495's will come with a harness but there are many on distribution that do not have the harness. If you get one without a harness, write Aristo with some proof of purchase and they'll send you a harness. 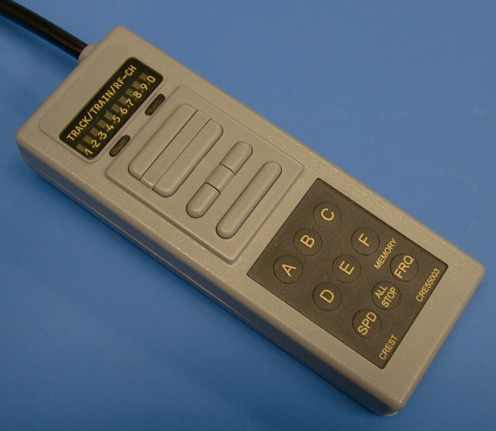 I also noticed that there are 75 MHz versions of the CRE-55474 and CRE-55475 accessory and turnout control receivers listed in the price list on the Aristo web site as well. It would appear that Crest is going to support purchasers of the 55491 with accessory equipment no matter which frequency that they choose. There is another row of 5 pins, labeled J3, on the top of the main board. These are for manufacturing test only and have no useful function to the end user. The TX for this RX is also reasonably new. This is the same TX that is used with the HO Train Engineer RX. It differs from the older 10 channel TX in that it operates at 75 MHz (making it useless to control the older 27 MHz equipment) and the case is gray instead of black. The bottom of the 55491 has the rectifiers, power switches, control electronics and the connector pins. A connector with pigtail wires is provided to allow the unit to be connected if it is not used in one of the newer Aristo locos with the DCC compatible main circuit board. The second row of pins is apparently intended to plug into the sound connector on a loco's DCC board. These are intended to support the unit when it is plugged into a recent model Aristo loco. They are not electrically connected to anything but probably should be insulated anyway if they are not used. This is a view of a DCC compatible main board taken from an SD45. The two connectors that are apparently intended to interface to the 55491 can be seen in the photo. The 55491 uses the same code set procedure as the HO TE RX except that it doesn't respond to a magnet to start the code set. The code set button does work. However, to use it, some visual feedback is needed and none is provided on the board. The HO TE flashes the loco's headlights to indicate what it is doing and when it is expecting some commands. Since I didn't have any interconnection diagrams to show me how to hook up some headlights, I had to initially program it by feel. Eventually, I figured out the lighting scheme and installed some LEDs to aid in programming. Code set is performed in three steps. Once the code set button is pressed, the RX expects to hear the A through F key to set momentum. "A" is no momentum, "F" is the longest. The second step is to set the reversing delay. If the first step had gone correctly, the lights would be flashing at a slower rate. "A" sets the shortest delay, "F" the longest. The lights will respond by going on steadily for a few seconds and then begin flashing again. The third step is to set the memory. "A" will cause the RX to remember it's last speed and direction setting when it first sees power. "F" will cause it to forget it last settings upon power up. Enabling the memory will allow the unit to operate more smoothly due to unsteady power if the unit is powered from the track. At each step, the keys have to be held for a couple of seconds for them to take effect. I hooked the 55491 to a motor and tried it out. After a few abortive attempts to get the code set done correctly, I got it to work. I did notice a few things that are different from previous TE receivers. The reversing keys implement the "other way" action that I had asked for many moons ago. This means that both direction buttons do exactly the same thing, they reverse the loco from its current direction instead of setting an absolute direction. Similar to the HO TE, a button press doesn't take effect until it is held for about one second. This means that if you are used to "feathering" the buttons to do fine speed changes, you'll have to change your habits. It takes some getting used to, but you can anticipate exactly when to release a button to get a small speed step. Overall, I prefer the old way with instant response to a button press. Due to the higher frequency of the 75 MHz Train Engineer, it uses a shorter antenna, 1.5 ft instead of 3 ft. Even this antenna is a subresonant structure. A whip antenna would normally be 1/4 wavelength long, or 3' at 75 MHz. The receiver is tuned to accommodate the shorter antenna. It was very hard to get a 3' long antenna inside a loco, the 1.5' antenna is easier to locate. However, this TE, like its predecessor, it very sensitive to antenna placement. When tested on my workbench with the antenna held vertical, I get control at 100' and that is straight through my house. With the engine sitting on the track and the antenna laying on the loco frame, the range is not as good, 20 to 30 feet. It is clear that the receiver has sufficient sensitivity, but it is also clear that the antenna treatment is critical. The range is significantly degraded when the loco is moved from bench height to sitting on the ground. This implies that the receiver doesn't like being near the ground, an unfortunate situation because many of us run out track on the ground. Therefore the antenna should be mounted as high up in the loco as practical. For battery power only installations, the antenna can be wired back to an abandoned power pickup. Connected this way, the range is better than 50 feet. This works ok because there is only one connection to the track and any noise voltage on the track does not actually get impressed across the antenna input. This approach doesn't work too well for track powered installations because the receiver is referenced back to one of the rails and noise on the track DOES get impressed across the antenna input and desensitizes the receiver. I have tried a whip antenna on a small loco where there isn't enough room inside to properly route the antenna. It works pretty well at the expense of a barely visible wire sticking out of the loco. The output waveform of the RX is PWC at 15.6 kHz. There is no linear mode. The output switch is an H-bridge configuration with low side switching so that there is no reversing relay. Reversing is done electronically. The CRE-55491 has a low idle current. This will be important to the folks that run battery power. If an engine is left standing, the idle current will still drain the battery. Lower idle current is better. The unit appears to achieve full operation at about 6.5 volts. This allows for a low voltage battery to be used if sufficient top speed is obtained at the low voltage. I also tested it to 24 volts and it appeared to work ok there too. The HO TE is sensitive to the waveform on the track. It won't work with a typical power pack's output waveform. It needs fairly clean DC or DCC power applied to the track. Somewhere on Aristo's forum, Aristo mentioned that the 55491 may not work properly with all kinds of power. It works with most. I have tested the load current capability of the 55491. The curve at the left shows the output voltage for a varying input voltage with a constant 5 ohm resistive load. At 6.5 volts and above, it approximates a series resistor of about 1.1 ohms. I find the output current capability to be a little under 3 amps sustained. It'll output 4 amps for a short while and then go into a shutdown mode. There is a device visible on the bottom side photo above that is apparently a thermal circuit breaker. It is the hottest part on the board. After running at high output current for a minute or so, the unit shuts down. It'll come back into operation after a few seconds with the power removed. It doesn't want to come on again by itself. It'll try to restart and draw pulses of current every second or so for a minute or so then it'll shutdown for good unit it gets chance to cool. Since the output impedance of the unit looks to be about an ohm, the voltage drop increases pretty linearly with current. You can read the voltage drop of the unit for any given load current from this curve. At full output capability, the total voltage drop will be about 3 volts. For those that don't care about voiding the manufacturer's warranty, the voltage drop can be reduced in applications where the input polarity is known, such as an on board battery powered installation, and where an extra volt or so can make a difference. An extra 1.25 volts of output voltage is waiting if you are willing to bypass the internal bridge rectifier and circuit breaker. BE AWARE that doing so will remove the built in overload protection as well. You MUST fuse your battery to provide that protection. If I were AristoCraft, I wouldn't hesitate for a short second to void the warranty for a unit that was returned with this modification in evidence. This photo shows where to connect to bypass the bridge. There is a 220 uF capacitor on the board which is the main filter capacitor. If you have a DC voltage to apply, you can connect it right across this capacitor at the output of the bridge rectifier. No cuts are required, just don't connect the regular input leads anywhere. Pay attention to the polarity! A mistake here and you'll get smoke. The green wire in the photo is the positive wire, the black one is the negative wire. The CRE-55491 is smaller than the older ART-5490 and will therefore fit more easily into the constrained spaces inside locos. Installation of the 55491 into a newer Aristo loco with the matching circuit board is easy. Just remove the shell, unplug the jumper plug on the main board and plug in the 55491. Route the antenna wire along the top of the shell. The only hard part is locating the code set switch. If you have a magnet reed switch handy, you might want to cut off the existing pushbutton switch and solder on the reed switch. Then hot glue the reed switch somewhere inside the shell so that you can activate the code set by waving a magnet across the outside of the shell. The 55491 will automatically connect itself to the headlights so that you'll be able to use them to aid programming. Note that the "F" key is used to turn the headlights on and off, but even if they were last set to off, they'll activate at the beginning of the code set procedure. In a loco that doesn't have the special Aristo board, you can still wire it like any ordinary receiver. The wire colors on the unit that I had were arbitrary. I am told by the engineers at Aristo that the production units will use the standard DCC color coding as shown on these diagrams. The red and black wires go to the power source. There is no polarity sensitivity at all so that it doesn't matter which is positive and which is negative. The orange and gray wires go to the ISOLATED motor. The motor MUST be isolated from all other wiring and structure or you will get smoke. The polarity of the orange and gray wires is significant. If they are backwards, the headlights won't match the loco direction. If there is a reversal, it is best to swap the motor wires as the front headlight provides better feedback during the code set procedure so that the white wire should always be connected to the front headlight. The white lead is for the front headlight and the yellow lead is for the rear headlight. These outputs are good for 200 mA each with a 500 mA surge. Aristo recommends that if incandescent lamps are used, that a minimum of a 100 ohm resistor be used in series with the bulb to limit surge currents. For LEDs, a 1K resistor will be about right. Note that the headlight wiring MUST be isolated from all other wiring as well or your will probably burn out the transistors that switch the lights. There is no blue wire on the 55491. This wire supplies the positive voltage to the headlights as the white and yellow wires switch to the internal ground of the 55491. There are two ways around this problem. You can make a synthetic blue wire with two diodes as shown in the diagram, or you can tap off the internal positive bus at the positive terminal of the 220 uF capacitor as shown in the photo in the previous section. 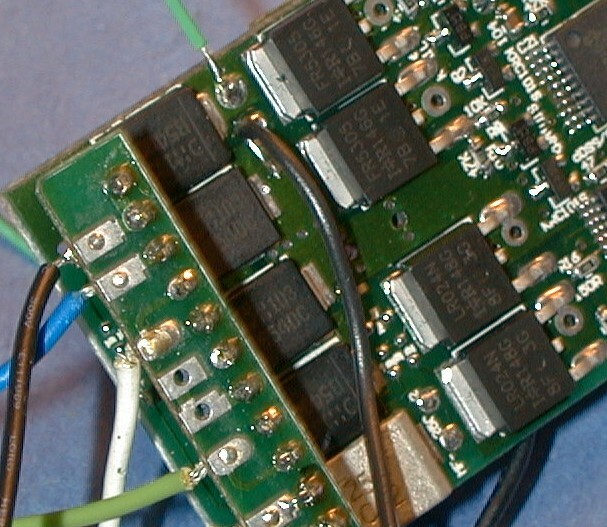 This internal voltage bus is actually brought out to pin 6 (counting from the triangle mark on the main board) on the main connector header, but is not extended to a solder pad. The internal ground is brought out to pin 7 and extends to two pads. I don't recommend that you use these on the wiring adapter because while the wiring adapter will work if you plug it in backwards, these pins will reverse. What was ground will be B+ and this could cause some problems. If you do plug the adapter in backwards, the motor will run "backwards" but the headlights will reverse as well so you won't be able to tell the difference, UNLESS you've used the B+/ground pads and then you probably WILL notice a difference. 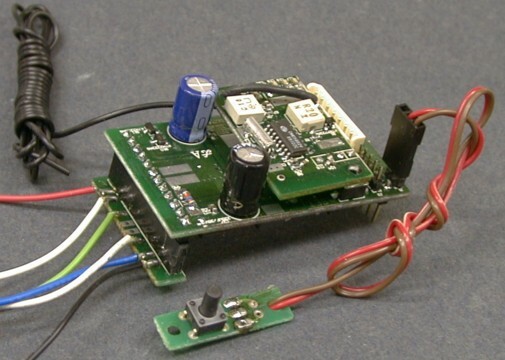 A battery powered installation is similar however, the diodes to emulate the blue wire are not required. Simply connect the positive power for the accessories from the battery positive terminal. Note the fuse. Do not do a battery installation without a fuse. Even though the 55491 is internally protected, you need to protect your wiring as well. This page has been accessed times since 3 Feb 02.